One of the things I complained a lot about my previous smartphone was the really poor battery life I got to live with after the latest firmware update. Battery life is one of those things a lot of people overlook when choosing their next phone and only notice (the lack of) it when they use it and realize how bad it is. Initially I was afraid the N9 wasn’t going to be remarkable in this aspect: some reviews actually praised it while others weren’t much impressed about it. When the device is idle with no data connection, the average battery consumption is around 6mA which is great and allows the phone to stay in standby for several days (probably more than a week!). When you have push notifications and other apps actively using the data connection the phone will at least use twice the energy, so it will use frequently around 16~18mA. This means the phone won’t be able to last more than a couple of days. 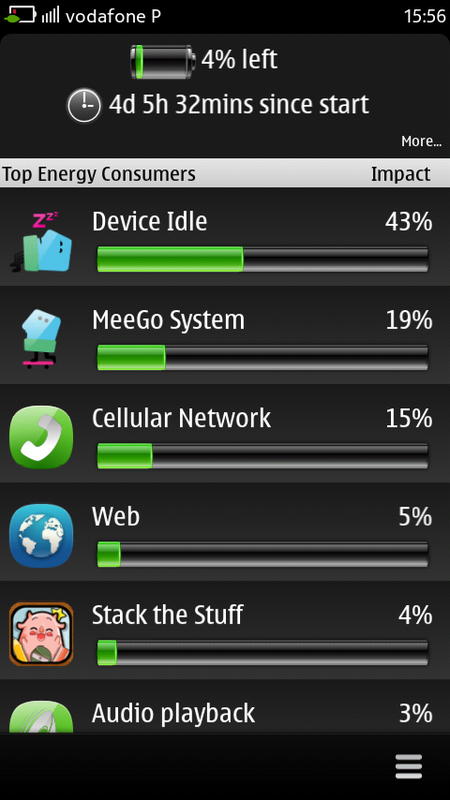 There’s an app called “Battery Usage” that I really recommend because it allows the user to check where the phone power is being used. 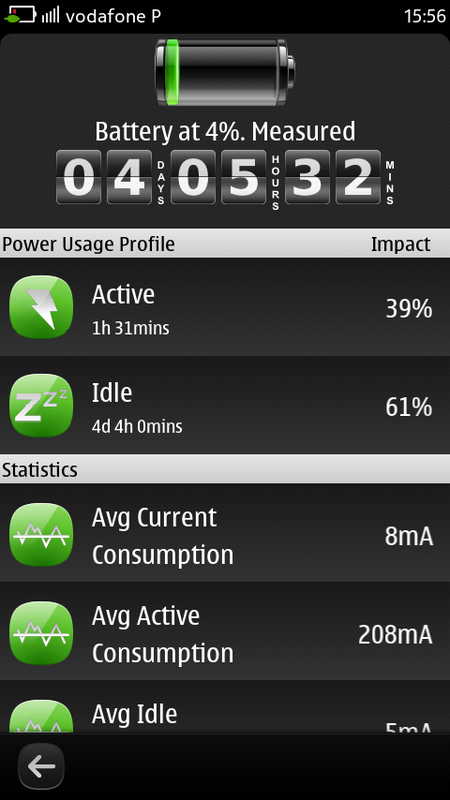 Below you can see how long my N9 can last on one charge, if you use it moderately. When it’s really cold outside, the phone will suddenly drop the indicated battery level (as much as 30%), but after you come into warmer places the battery level will rise again by itself and recover the original displayed battery level. This means the phone is probably not measuring correctly the battery level when used in low temperature environments. If you use the phone in a more intensive way, such as playing a game, the battery level will also decrease significantly to recover again when you stop using the phone for a while, therefore the battery level measuring system does not seem very reliable to me. Since the problem is being too conservative (and not too optimistic) I can live with it until Nokia fixes that. This entry was posted on February 20, 2012 at 14:00 and is filed under MeeGo, Nokia. You can follow any responses to this entry through the RSS 2.0 feed. You can leave a response, or trackback from your own site.